Whether it is about building schools in Afghanistan or constructing homes in Bosnia or setting on course development and business in previously war torn regions of Africa, Asia, south America and Europe, clearing land mines is essential for physical safety and sense of security necessary for peace to advance. In many former conflict zones, as many or more are hurt/killed by landmines post conflict as they are during the conflict. 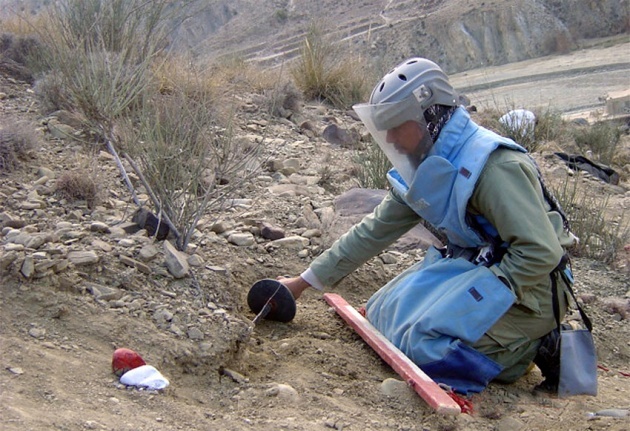 Landmines and explosive remnants of war hamper development and endanger lives. Let’s eliminate them together for a safe sustainable world. The UN is currently working closely with governments and non-governmental organizations in more than 40 countries to implement mine risk education and assist victims with disabilities. In his message, Mr. Ban said that de-miners have been assisting in the management of stockpiles of landmines in Libya, Albania, Côte d’Ivoire and the Democratic Republic of the Congo (DRC). In Libya, thousands of explosive remnants of war have been secured or cleared from schools, roads or residential areas, and tens of thousands of people have received risk education. In the DRC, Albania and Côte d’Ivoire, mine action operators have been assisting in stockpile management over the past year. Mr. Ban commended the 159 States that have agreed to the Antipersonnel Mine Ban Convention, which bans the use, stockpiling, production and transfer of anti-personnel mines. States who are parties to the Convention also agree to destroy anti-personnel mines and assist landmine victims. The President of the General Assembly, Nassir Abdulaziz Al-Nasser, also called on countries to adhere to international treaties on this issue, and urged States to “provide assistance to countries affected by mines and explosive remnants of war,” stressing that the presence of these devices have serious humanitarian and economic consequences. To mark the Day, a multimedia exhibition, entitled “UN Common Cause,” will open at UN Headquarters on Wednesday, featuring works by New York-based photographer Marco Grob, who travelled to Afghanistan and Cambodia to photograph mine victims for the UN Development Programme (UNDP) and the UN Mine Action Team (UNMAT), and Italian photojournalist Giovanni Diffidenti, who spent time documenting the work of the Joint Mine Action Team in Libya. The exhibit will also display educational models of landmines, cluster munitions and other explosives, as well as videos providing a glimpse into the work of UNMAT. UN missions around the world are also marking the Day. The UN Interim Force in Lebanon (UNIFIL) held a ceremony at its headquarters in Naquora to mark the 200th point de-mined on the Line of Withdrawal – also known as the Blue Line – which demarcates the border between Lebanon and Israel. As part of the observance, the Programme Manager of the UN Mine Action Support Team (UNMAST), Michael Hands, roller-skied from the city of Tyre to UNIFIL headquarters, where he was received by UNFIL’s Head of Mission and Force Commander, Major-General Paolo Serra. Maj-.Gen. Serra underlined the importance of the Blue Line marking process as “an essential task of our mandate,” and added that “completing the process will reduce the potential for incidents and tensions in the area.” Since 2006, UNIFIL has de-mined 4.8 million square metres of affected land and destroyed more than 34,000 unexploded ordnance and mines in southern Lebanon. “Today the United Nations joins Iraqis and Iraqi friends to call for an Iraq free of landmines by 2018,” Mr. Kobler said, referring to Iraq’s commitment in 2008 under the Ottawa Convention, to never again use, produce, acquire, or export anti-personnel mines. Iraq is one of the most mine-contaminated countries in the world, with unexploded ordnance covering 1,730 square kilometres, affecting one in every 20 Iraqis. To dater, clearance teams have removed a total of 171,479 items of unexploded ordnance and conducted mine risk education for more than 130,276 people.